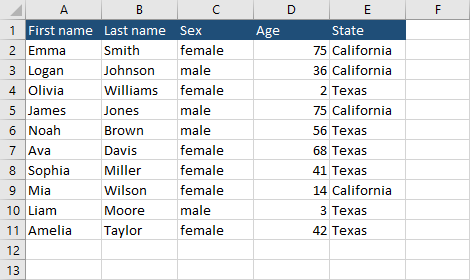 Let’s suppose you have an example with a list of people with names, age, and place of residence. What we want to do here is to select the youngest and the oldest woman who lives in Texas. You can copy the following example and paste it into a worksheet. Here, is what you need to do in order to find the highest and the lowest values. Enter the following formula into the empty cell. Use the Ctrl + Shift + Enter keyboard shortcut to create an array formula.